The Chicago Blackhawks are going to have up their game as the the level of competition ramps up considerably tonight, since they face the team that took them to six games in last year’s hard fought Stanley Cup Final. But the Blackhawks are not the same team that took te cup last season. Due to injury and roster turnover, this team is far from the one that vanquished the Lightning. And in contrast, the Lightning remain a significant challenge in this Stanley Cup rematch. The Tampa Bay Lightning have speed and creativity that could expose a Hawk defense that right now is heavily relying on less-experienced players. With salary-cap constraints that forced offseason trades, like that of key forwards Brandon Saad, Patrick Sharp and Kris Versteeg and offensive contributors such as Johnny Oduya, Brad Richards and Antoine Vermette, who all left via free agency. Those are big names. So since, Chicago has endured lots of transition and adversity since defeating the Tampa Bay Lightning for the Stanley Cup. But recently they seem to be getting a little closer to regaining their championship fierceness. They will be looking for a third straight Saturday night win at the United Center in a game that will be their first match up against Tampa Bay beating them in Game 6 of the Finals. Chicago has been a bit distracted by their star’s, Patrick Kane’s, ongoing legal problems. Chicago’s top defenseman, Duncan Keith’s also, recently had knee surgery that will sideline him for 4 to 6 weeks, . But lucky for Chicago, Kane’s legal distractions have not affected his play. The star forward has scored five goals and five assists in seven games. In their last game, against Florida, Brent Seabrook had a goal and two assists as Chicago who’s 4-3-0, successfully handled its first game without Keith. 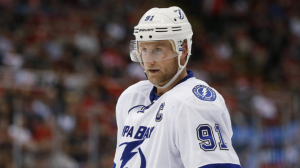 He was the key player that lead the defense corps against the Lightning captain, Steven Stamkos, who was limited to just one assist in last season’s finals. Artem Anisimov, was a player Chicago acquired from Columbus in the Saad deal. He scored goals in two straight games as he is second to Kane with three goals scored. Along with rookies Artemi Panarin and Viktor Svedberg, he will be expected to help soften the blow of roster changes. Tampa Bay who is currentlty a solid 5-2-1, has had periods of inconsistency as well, even though they have kept the nucleus of the last season’s team. They won their first three games, and then lost three of four before getting back on track with a 4-3 victory last night in Winnipeg, getting the two points in a thrilling overtime, won on Ondrej Palat’s goal 36 seconds in. Victor Hedman got a third assist on the game-winner, and he has five points in two games. Stamkos has five goals in his last seven, but teammate and star center, Tyler Johnson, hasn’t scored yet compared to hisg 29 goals from last season. 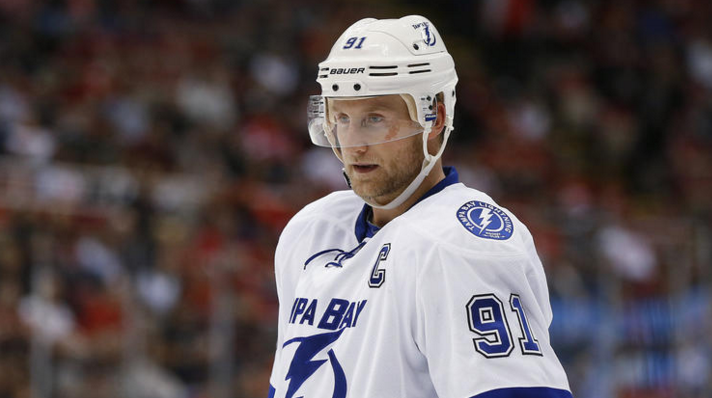 A distraction could be that Stamkos has not resigned his contract with the Lightning and there has been a lot of speculation as to why. He can become a free agent at the end of this season, so the lack of signing him to a monster contract in comparison to the likes of Kane, has many hockey experts talking. Lightning Ben Bishop, has played pretty well with a season-high 33 saves last night, but he allowed a minimum of three goals for the third time in four outings. He’s started every game so far this season, and will probably play again tonight as regular backup Andrei Vasilevskiy is still sidelined by a dangerous blood clot. Their current backup, Kevin Poulin, has only played one game in the NHL, for the New York Islanders last season. In the Cup Finals, Bishop posted a 2.31 goals-against average and stopped 28 shots in a 4-0 home win over the Blackhawks on Feb. 27, which was a nice win in response to previous Chicago’s 3-2 shootout win at home on Nov. 11. It will be seen tonight how this heated battle will continue. Tampa Bay will be up against Chicago’s Corey Crawford. It will be the first time since his 25-save performance in Chicago’s 2-0 win in Game 6. He was fierce against the Lightning where he compiled a 1.69 GAA and yielded only two goals over the final three wins. He’s also on a winning streak, giving up only three goals on 41 shots against Florida and Columbus combined. That’s sharp, and that’s why we think they have the edge.